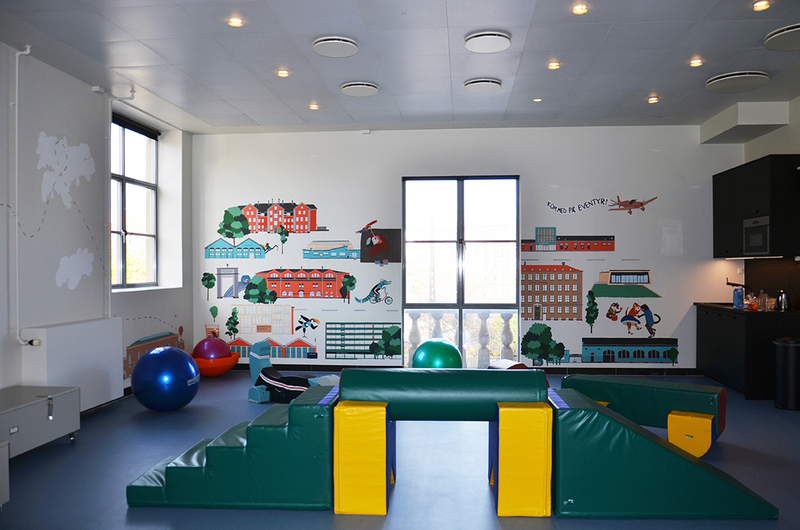 Design of an activity room for babies and toddlers in Øbro-Hallen. The first public indoor swimming pool in Denmark. The concept was developed with Production Designer Käthe Stougaard Kofoed Espersen and the interiors in collaboration with Space and Furniture Designer Mette Karina Johansen. Gross motor skills; fine motor skills; balance; language; rhythm; relaxation and Imitation. 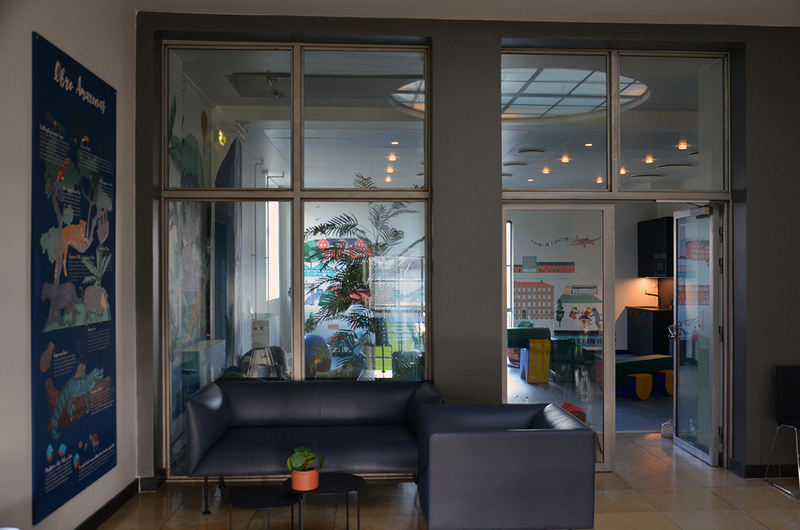 We wanted to connect the exotic from another continent to the room in Øbro-Hallen. In the Amazon, life is lived one half of the year in water and the other half on land. This allowed us to include both sea- and land animals. This way, learning can take place on both levels, and the swimming pool element becomes a natural part of the story. 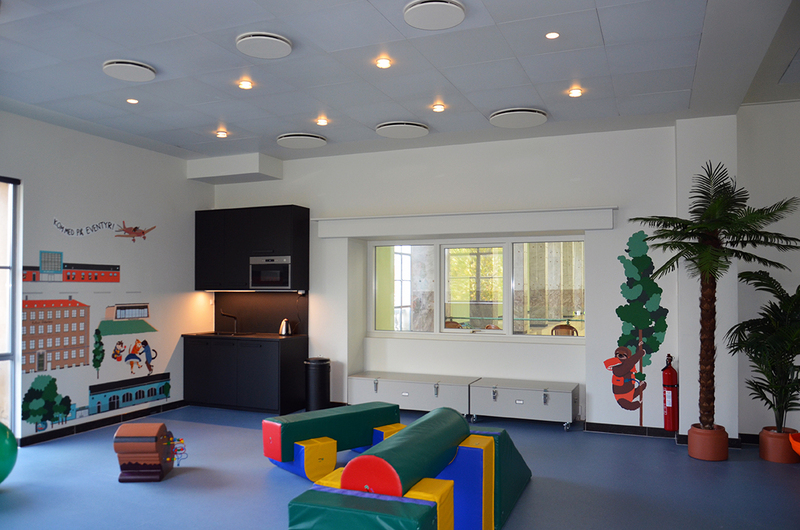 By connecting all the physical elements with a narrative, the features of the room are placed in a context that both inspire focused learning as well as new innovative compositions. For this we have created a story that will tie the different parts together and breathe life into both the room itself and the learning equipment. A group of animals from the Amazon jungle have decided, to go to town to learn all the skills that people possess. They take off in a hot air balloon and land on the top of Øbro-Hallen. Here they find a room they can live in while they practice the things they would each like to learn. They are very different animals, but in the city you have to live with many different types of individuals. was really good at fishing and could also swim if needed. He loved telling fishy stories, but when there were so many keeping an eye on him all the time it was hard to spice up the stories so they could be really good. If he could just travel away for a while and come back with some really wild experiences. could not fly very far at a time because she was a bit on the large side. So it was great that she was so good at jumping from tree to tree, to grab the ripest fruits. But it was also a bit tiring in the long run and she was created to fly. Perhaps yoga would help to unite the abilities she herself thought she possessed. had feathers in really beautiful colours there was just one problem, all his neighbours looked just as brilliant as he did. And he would like to be the most colourful, so that everyone would really notice him. climbed the trees like a true master, greatly helped by his long gripping tail There had to be other things to climb than trees. What if he could conquer the large square buildings. Hopefully the surfaces would not be too smooth. were always dancing. They got so absorbed by it, that they always tumbled over everything in the thick jungle. The worst thing was when they fell in the river because it was really hard to get up with dance shoes on. They could use a real dance floor – and some music! was not like the other sloths in jungle. She would so like to swim, but she did not know anyone who would teach her and It seemed a bit dangerous to just jump in like Cai-Man had suggested it. was always sitting and fiddling with different things while the others grazed or were taking a walk on the bottom of the river. You can do so many different things with these fingers, she thought. loved music, but in the jungle there were only stones and twigs to play with. And the turtles did not sit still long enough for him to make a proper drum solo. He could not really build an instrument, with the hard hoofs he had. If only he could get a hold on a real drum. Who was just called Cai-Man, had such small short legs. He was only good at swimming, but in the water he only really used his tail. Now he wanted to try to be fast on land and maybe a bicycle would be just the thing for him. But the jungle was not the best place to practice cycling. were a couple of bandits, they were always whizzing around exploring the jungle. The best was the rainy season where they could get around everywhere. But they felt they had seen it all and were ready for new adventures. just wanted to chill out and get warmed by the sun all day if they could. But it sure was annoying with all the butterflies swarming around their eyes. If only they could find a place where they could be left in peace. The visual narrative starts outside the room on the repos just before you enter the room. 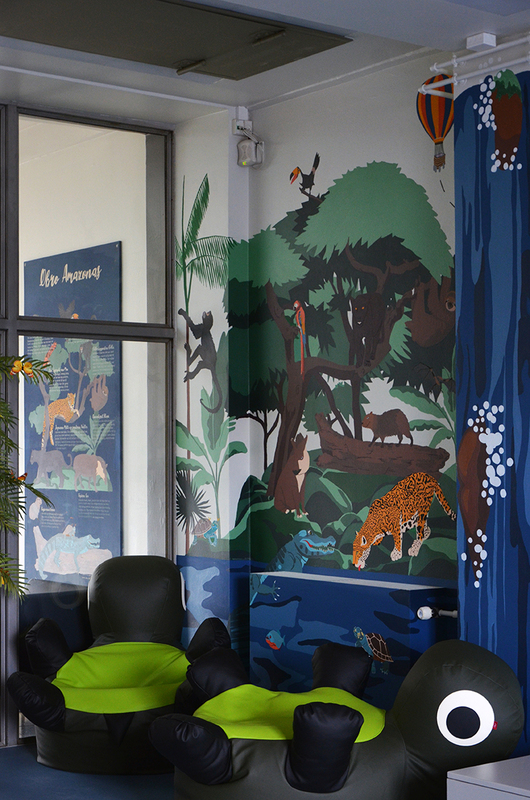 The large poster functions as an introduction to the jungle animals, who all have their own specific reason for travelling to the city. The jungle illustration continues inside the room, where you can see the animals just before the air ballon lands to take them away. The animals on their way to the city. The hot air balloon has landed on top of Øbro-Hallen and the urban landscape begins. 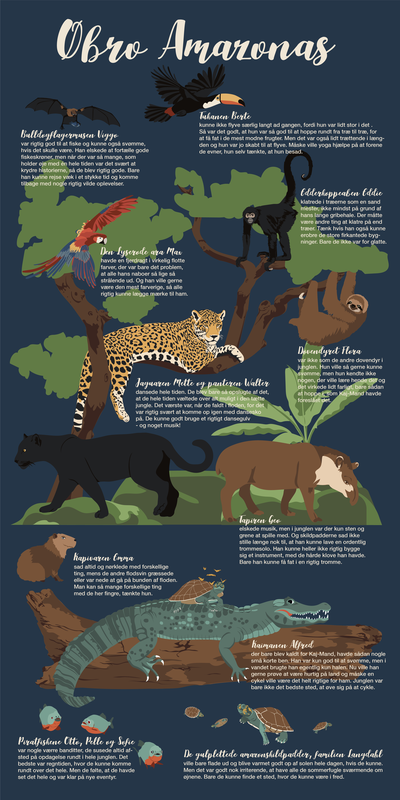 Here the animals are illustrated while in progress of trying all the things they’ve come for. 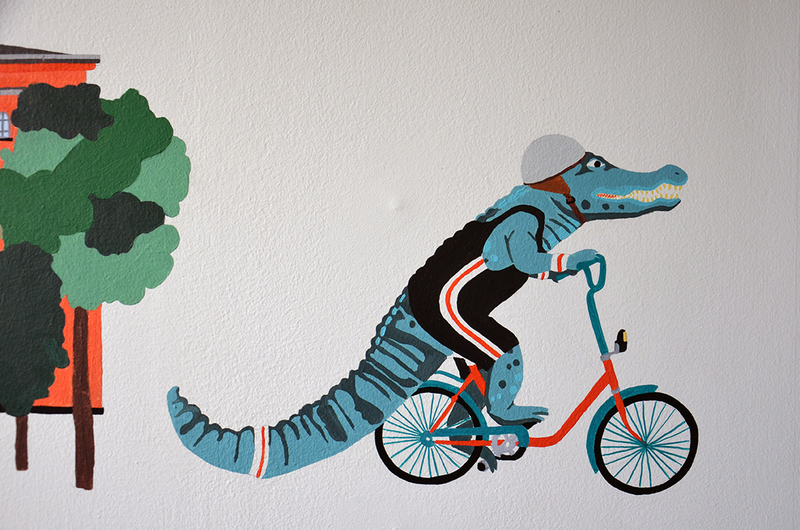 The caiman Alfred, who is finally in town riding a bike becomes part of the cityscape. 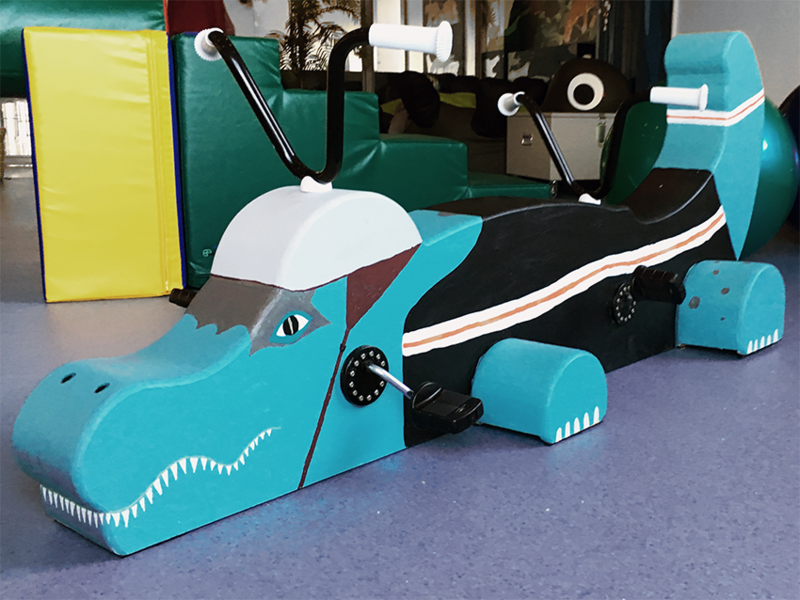 The caiman Alfred, produced in wood as a bicycle toy. The small kitchen and windows facing the swimming pool. 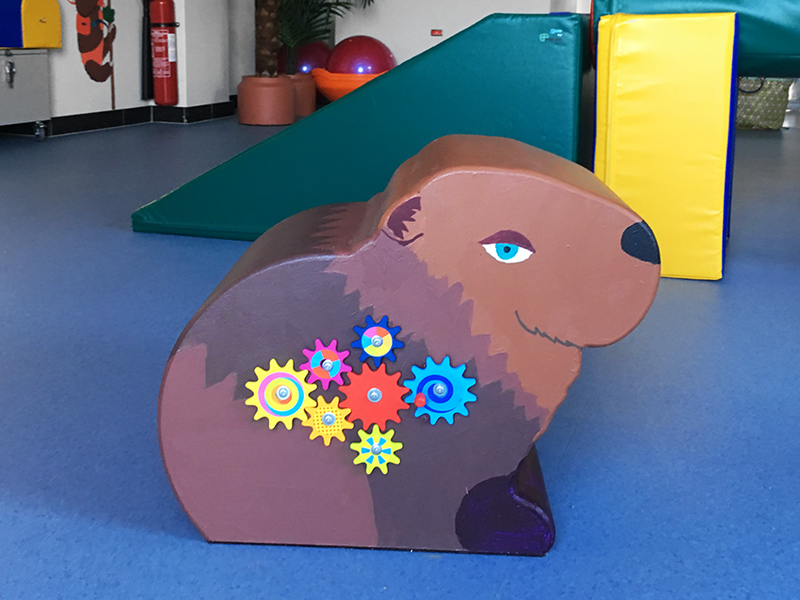 The capybara Emma, produced in wood as a toy for fine motor skills.